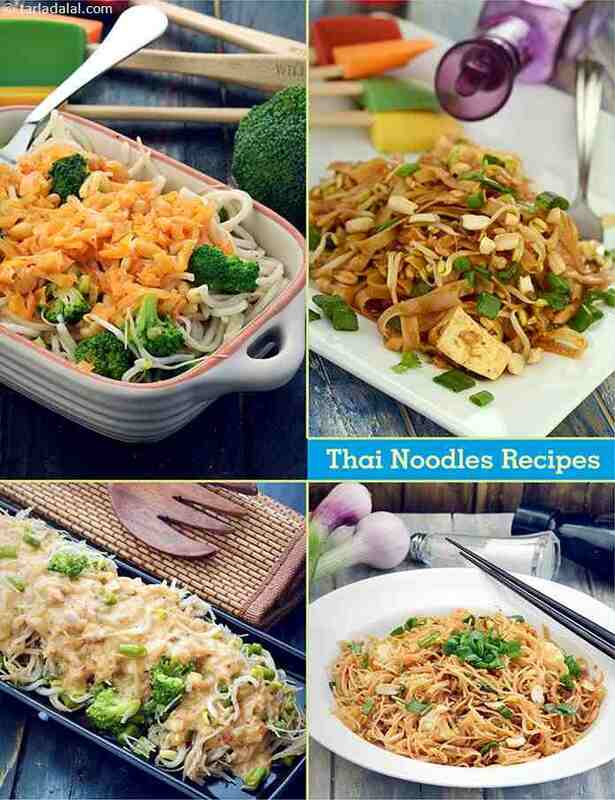 We all have grown up loving the famous Pad Thai Noodles and from that other famous Thai recipes. Noodles with Peanut Sauce Noodles with Peanut Sauce : A mouth-watering sweet and sour peanut sauce dresses a satiating combination of sautéed veggies and noodles, to make a dish that will appeal to all. As in most Oriental dishes, the Noodles with Peanut Sauce also features an assortment of crunchy veggies such as bean sprouts, carrots and cabbage along with succulent paneer, all cooked minimally to retain their exciting textures. Pad Thai Noodles : A Thai favourite. These flat rice noodles are cooked and tossed with paneer, spring onion, bean sprouts, peanuts, garlic and other spices. Use up the remaining peanuts for a garnish. Tastes wonderful with a Thai Green Curry as accompaniment! A colourful thai preparation of noodles cooked with coconut cream and fresh vegetables. A colourful thai style preparation, the noodles here are cooked with coconut cream and fresh vegetables.